The tangerine is a cultivar of Citrus reticulata Blanco. See Citrus reticulata ‘Mandarin Orange’ for a description of the Mandarin and Tangerine group. ‘Thorny Mandarin or Tangerine. One of the best-flavoured of all mandarins. Tree a dense bush requiring severe thinning out to bear large fruit; thorny, except some sub-varieties which are thornless. Fruit small to large, according to number of fruit, vigour of trees, and soil and climate; roundish, flattened, stem fine and firmly attached to fruit; skins tight, thin, and smooth, pale yellow. Pulp juicy and aromatic. This fruit becomes dry and puffy if allowed to hang too long.’ [Despeissis p.243/1903]. 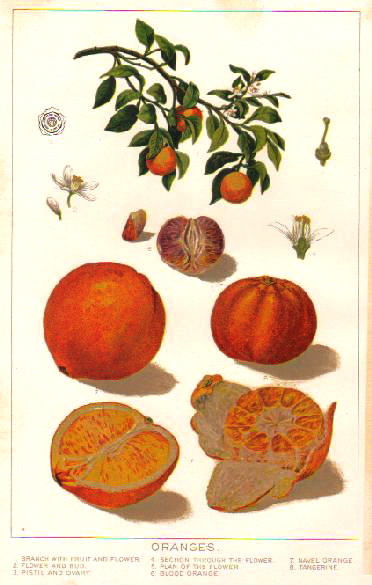 An old variety of orange, probably cultivated for more than a thousand years. I have no specific information on its introduction. Listed in the 1845, 1850 and 1857 catalogues as ‘Tangierine’ [Orange tribe no.16/1845]. In the Hortus Mandarin Oranges and the Tangerine are included under the name Citrus reticulata Blanco, although this name is not accepted by all authorities. Citrus nobilis Lour. is commonly used for some of the large Mandarin Oranges, particularly those known as King Orange or King Mandarin. The authors of ‘Sorting Citrus Names’ make the following point in relation to Citrus tangerina, the Dancy or Italian Tangerine. ‘Some of the above common names may be better matched to other groups (Mandarin, Tangerine or Satsuma) or to some cultivars of mandarin orange, or even to other "species" such as C. deliciosa. Certainly C. deliciosa and C. tangerina are the same thing for many people but in reality they should be differentiated. C. deliciosa could be called Mediterranean mandarins whilst C. tangerina could be called common mandarins or clementines.’ [www.plantnames.unimelb.edu.au/new/Citrus.html]. Citrus reticulata ‘Tangerine’ | source unknown. The Tangerine is the orange at bottom right, both entire and sectioned.